When the Los Angeles Lakers acquired LeBron James, they became a popular pick to make the playoffs this year and were even considered contenders for a while. At one point during the preseason, they had better odds to win the Western Conference (+350) than everyone but the Golden State Warriors. As for the NBA Finals, the Lakers had better odds (+500) than everyone other than the Warriors (-175) and Boston Celtics (+450). However, not only will those dreams fail to be realized, but the Lakers may not win another game. In light of their most recent announcement, however, the odds on them winning one of their remaining six games are going to be kind of long. 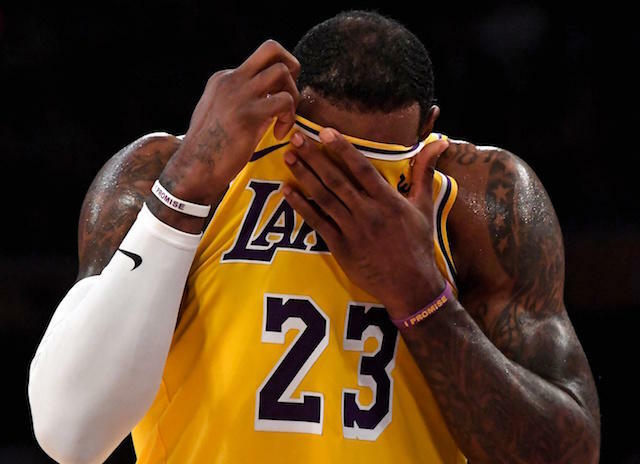 It seems that the Lakers have decided to sit LeBron James for the rest of the season. Of course, the last thing the Lakers need is for their high-priced free agent prize to suffer an injury while playing in a meaningless game. Even though he was cleared to return from the groin injury, rumor has it that he has been playing with a lot of discomfort. With the 17 games he missed after injuring his groin earlier in the season, James will end the year having played in just 55 games, easily the fewest of his career. He finishes the season averaging 27.4 points, 8.5 rebounds, ad 8.3 assists a game. The Lakers will now be without James, Lonzo Ball, Josh Hart, and Brandon Ingram for the remainder of the season. With how the team is playing this season, the Lakers it is hard to imagine the team putting up much of a fight down the stretch, anyway. They have a short road trip up next with a game in New Orleans on Sunday and Oklahoma City on Tuesday. Then it’s back home for a game against Golden State (Thursday), a game with the Clippers (Friday), and then against Utah (Sunday, April 7) and Portland (Tuesday, April 9). After failing to end the once-proud franchise’s streak of seasons not in the playoffs, Luke Walton will likely be let go. According to the rumor mill, the list of potential candidates to replace Walton includes LeBron’s former head coach in Cleveland, Ty Lue, and former Bucks head coach Jason Kidd.